Recently Activision announced that the ever popular Multiplayer map, Nuketown is being completely reimagined for the upcoming Call Of Duty: Black Ops II! The Nuketown 2025 multiplayer map will be available with launch units of Call of Duty: Black Ops II. 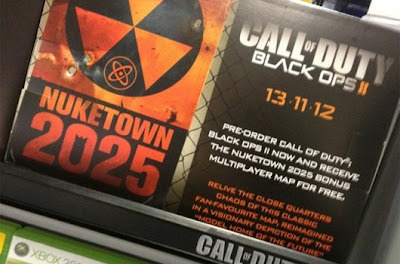 Anyone who pre-orders the game at participating retailers worldwide will get their copy of Call of Duty: Black Ops II at launch, which will include the Nuketown 2025 downloadable bonus map.